Time again for another Montgomery book giveaway. This time I'm offering up a copy of Kilmeny of the Orchard to one of you. This is among Montgomery's shorter works and is another more adult title. It tells the story of Kilmeny, who has been mute from birth. She can. however. play the violin quite masterfully, using music to express herself. This is how she ultimately attracts the attention of a young man named Eric. Eric wishes to marry the beautiful Kilmeny but she will not agree to do so because she feels as if her condition will hold him back in life. It's a quick romance with a happy ending (that's not spoiling anything because this is Montgomery, after all). 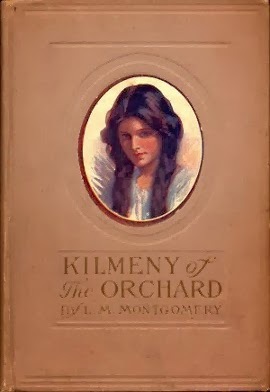 Kilmeny of the Orchard is usually the title I first offer to people who want to read outside of Anne but are short on time. Kilmeny is not my favorite character but she is memorable for all that and, again, it's a quick read. If you are interested in reading this one and have not done so, or are merely looking to add it to your home collection, simply leave a comment below. PLEASE be sure to leave a valid e-mail address. This contest is open to U.S. and Canadian residents only and will be open through Thursday, January 30th. THIS CONTEST IS NOW CLOSED. THE WINNER, as selected by Random.org, is #7 - Jan. Congratulations!! I've never read this one! Thanks for the chance to enter! I've never read this one either and would love to! I don't remember hearing of this one - would love to give it a try! Delighted to find your challenge ! and then this giveaway to add to the pleasure - TY!